Lucia Michelutti is Professor of Anthropology at the University College London. Ashraf Hoque is Teaching Fellow in the Department of Anthropology at the University College London. Nicolas Martin is Assistant Professor at the University of Zurich. David Picherit is Research Fellow at the French National Centre for Scientific Research. Paul Rollier is Assistant Professor in South Asian Studies at the University of St. Gallen. Arild E. Ruud is Professor of South Asian Studies at the University of Oslo. Clarinda Still is Research Associate at the University College London. 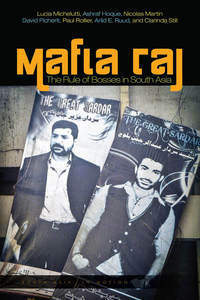 "Through meticulous and uniquely collaborative ethnography, Mafia Raj opens readers' eyes to the murky world of bosses in South Asia. With unforgettable portraits of the gangsters, politicians, hustlers, and extortionists dotting the region, this is the rare scholarly account that upends our commonly accepted notions of democracy, formality, and legitimacy." "Why does the figure of 'the boss,' in its various guises, loom so large in South Asia? In answering this question, the authors of this engagingly written book make a path-breaking contribution to the study of South Asian politics."